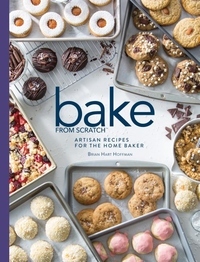 Bake from Scratch is back with in a third volume and it's huge! The 400+ pages are packed with delicious recipes that are sure to bring out the baker in all of us! Featuring every baked good from the third year of Bake from Scratch magazine, this collection of recipes encompasses everything from the art of the Southern biscuit to a birthday cake blowout. Inside this hardcover volume you will find pages upon pages of quick breads and yeast breads, Bundt cakes and layer cakes, pastries, cookies, and more. With step-by-step technique tutorials and professional tips from our test kitchen, it's the home baker's ultimate resource and the essential guide to bringing artisan baking to your kitchen.